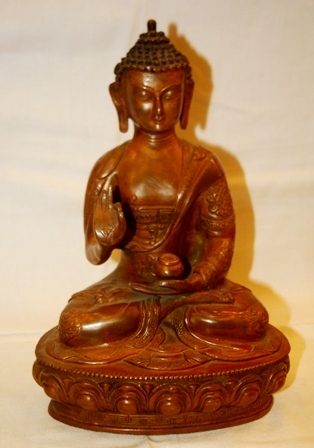 BUY SITTING BUDDHA, 12 INCHES GAUTAMA BUDDHA IDOL IN EXQUISUITE WOOD TONE HAND CRAFTED BRASS. Buy Sitting Buddha Statue in 12 inches Wood Tone Brass Cast, handcrafted at Buddha Bazaar by our local artists. The Buddha holds the Vase of Alms in his hand which signifies the humility of a wandering Sage and his right hand extends out in a Mudra of Blessing. Buy Buddha Statue Online from our online store, Buddha Bazaar and pray with our special Buddhist incense as part of our free gift with this item.Happy Prayers. Height: 12 inches, Length: 8 inches. Like the information on our Buddha Statue Brass, visit us here for more information on Buddhism.